(CNN) - Ruling out recent questions on whether Jon Huntsman might run for president as an Independent, the former Utah governor put his foot down Saturday and said he's sticking with the GOP. "I'm running as a Republican, proudly so," he told CNN at a New Hampshire gun show. "And I think we will get a lot of Independent votes, no doubt about that." Huntsman, who in recent weeks has worked to appeal to what he calls a "center-right" demographic, has struggled to break into the race's top tier with poll numbers in the low single-digits. His comments came in response to recent questions in the media about the White House hopeful considering a run as a third-party candidate to appeal to those disenchanted with the Republican tea party base. "It would seem that if Huntsman is still serious about being the next president of the United States, then instead of trying to win over the social conservatives who never liked him anyway, he should reboot his campaign and run as an independent," said LZ Granderson in an opinion piece for CNN on Tuesday. A New York Times analysis earlier this summer also speculated that Huntsman might fare better on the Independent ticket. 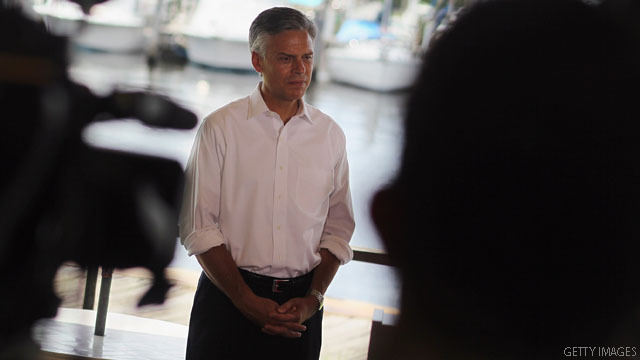 Huntsman is zeroing in on New Hampshire, keeping the first-in-the-nation primary state his primary focus. Independents are allowed to vote in the state's primary, with 42 percent of New Hampshire's voters registered as "undeclared," according to the state's most recent voter data in March. - CNN Political Producer Rachel Streitfeld contributed to this report. Huntsman's best shot is to get obama to drop biden & let him be his VP. Proudly? I would bury my head in the sand if I were a Republican! This guy could beat President Obama. Unfortunately, the ticket will likely be Palin/Perry. To the people, center-right or moderate Republicans are not good enough and don't pass the purity test. Because of that, it is likely that Huntsman would not (and will not) get the nomination from the GOP. Hunts man is probably the most moderate but he still vas that repugs supply side mantra and deregulations, to shorten our future generations life expectancy, raging cost of healthcare. The repugs keep saying that our future generation future is dying because of finance. What about their future in health, I would rather be heathy and a little bit poorer, than have cancer and rich. My health takes precedence over all. These repugs first say it was high taxes that are hindering jobs growth, now they realized that 35% of big businesses don't pay taxes and taxes are the lowes in 60 years, they switch to regulations. I know as soon as we find out it is not regulations is the root cause, they switch again. They ignore the main components of GREED and DEMAND. for some reason repugs don't think greed is a factor in big businesses decision to do business. First of all businesses need location location location, to maximize their demand area. Right now china is growing at 6 to 7 percent of their GDP, and America is growing at 1 percent, which country would you chose to invest in? Obama need to create demand in this country with a national modernization of our infrastructure, this will have these companies come running back to America badgering consumers to spend some of their demand money with them. Yes, because there's nothing more to be proud of than to be a teabagger. The koch brothers are so proud of their teatards and that fool with those muttonchops! There isn`t a sufficient enough difference between Obama and Huntsman to warrant a change. Smart voters will stick with the guy that has gotten acclimated to this tough job. With regards to moving the country forward, the key is to through out an obstructionist, obstinent, Congress. Our problem isn`t in the Oval Office; its in the Capitol Rotunda. He might as well end the speculation period and go back to Utah. No Mormons please. That really is a shame... he has no chance as a GOP candidate, but this is going to be one election where it is quite possible for an independent to make it, for obvious reasons. Some think Huntsman is the “smartest” GOP candidate in the field. He sure is not when he thinks he could be a successful President with THAT lunatic GOP/TP crowd behind him. But, perhaps his soul is not that different from there’s? Bashing, lying, obstructing, no solutions – greed over people? You might want to take a closer look!